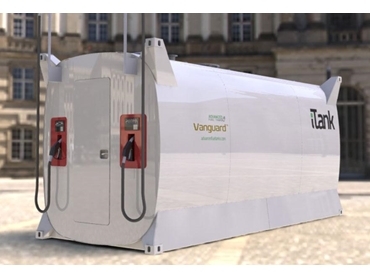 Advanced Fuel Tanks now stocks Vanguard portable diesel fuel tanks, which have been specifically designed to provide tough, reliable and low-cost-per-litre diesel storage. These portable diesel fuel tanks are available in a traditional cylindrical shape, or a new iTank rectangular design which is ideal for applications where space is at a premium. Both varieties feature a double skin steel construction, and provide 100% secondary containment without needing further bunding. Primarily designed for use with diesel, these fuel tanks can also be used for the storage of light fuel oil, lubricants, and other fuels in certain circumstances. iTank varieties of these diesel fuel tanks are built to standard ISO container sizing to ensure they are simple to ship and transport domestically and internationally. Additionally, they also feature full length pedestals with installation points to make installation simple and eliminate rubbish and debris collection under the tank.